Qualification : Candidates must possess Intermediate (class 12th)/Degree/Diploma. Candidates should have computer knowledge for all posts. Application Fee: Rs. 500 for UR, Rs. 250 for Reserved category with Rs. 40 as E-mitra/CSC Kiosk charge. Selection Criteria: 70% weightage of selection will be done on the basis of class 12th/Diploma/Degree marks. Remaining 30% weightage of selection will be done on the basis of experience in MGNREGA. 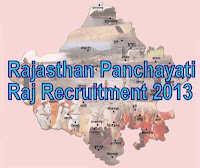 How to Apply: Eligible and interested candidates should apply ONLINE though official website of Rajasthan panchayati raj www.examssr.rajasthan.gov.in on or before 4th May 2013.